Besse Cooper who lived till she was 116 claims that the secret to a long life was to “Mind your own business and don’t eat junk food. Treat everyone the way you want to be treated, work hard and love what you do.” Oh bless her soul how gorgeous! What great advice. 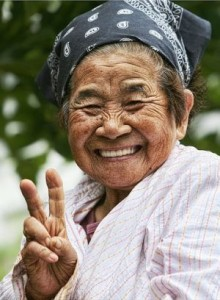 Bonita Zigrang, (108) claims that to live a long life you must ‘Have a good appetite, lots of friends and keep busy’. ‘Stay active…even at 100. Eat in a balanced way…’ was the advice from Benjamin Goldfaden, aged 99. According to Samuel Ball (102) you don’t even need to shun the booze… ‘Have a good wife, two scotches a night and be easy going’. Helen Mulligan thinks it might even cure a cold… ‘Take it easy, enjoy life, what will be will be. Sleep well, have a Bailey’s irish Cream before bed if you have a cold – you will wake up fine the next monring’. Morris Lensky (101) gives prunes the tick of approval ‘You have to be lucky, but I made the best of things when bad things happened. I also ate prunes every single day. Apparently Jeanne Louise Calment who lived till the age of 122 ate 2 pounds of chocolate every week and was very fond of a glass of port wine. When asked what her secret to a long life was she said she drank wine, ate chocolate, and used olive oil in her food every day. 112-year-old, Salustiano Sanchez Blazquez says bananas helped him reach triple figures. 114 year old Brazilian centenerean Maria Gomes Valentim started each day with fruit, bread and coffee and would often be found enjoying Brazils national dish feijoada – a stew made of pork, beef, beans and vegetables. So it turns out bacon may be a superfood after all! Pearl Cantrell aged 105 says her successful aging is due to eating bacon for breakfast! Li Aizhu has a simple explanation for her longevity claiming that her secret is that she eats a lot of peanut oil….If that includes peanut butter I’m going to live till I’m 1000!! Dr. Leila Denmark who lived to be 114, was a paediatrician who continued working till she was 103! She attributes her long life to ‘drinking only water and including a protein and two vegetables with every meal’. And who would of thought that the secret to making it to 99 is to “Try not to eat anything that’s healthy. It’s true. I eat whatever I want. The secret to longevity is ice cream.” Maybe Paul Marcus’ is on to something! I certainly wouldn’t oppose to icecream being the next superfood! Mr David Henderson, who lived to 109, credits his old age to porridge, prunes, and never going to bed on a full stomach. Raw eggs and plenty of sleep helped Emma Morano reach her 114th birthday. She ate 2 eggs everyday – one cooked and one raw. Claudia who is just shy of her 100th birthday says ‘you just keep working and you eat minestrone, beans and potatoes’. So there you have it, some insightful comments from those who have lived long and flourishing lives. As you can see they all have varied diets but the overall theme was a balanced and simple diet. Many included foods that have recently been labelled by some as ‘toxic’ or foods that should be avoided such as beans, legumes, fruit, potatoes and even icecream, chocolate and alcohol!. These prestigious people don’t count calories, they don’t avoid gluten they just eat simple, enjoyable food. While these are quotes from a select few of the oldest living people, research into centenarians especially those living in the notorious ‘blue zone’ indicates that most enjoy a diet of fresh minimally processed food of seasonal fruits and vegetable, beans, nuts, seeds and grains. We know food is only one aspect of a healthy lifestyle. The common factors that these long lived folk claim helped them hit 100 were: being active, keeping busy, perusing the things that they were passionate about, having a positive outlook, relaxing, not stressing, love and of course good luck!